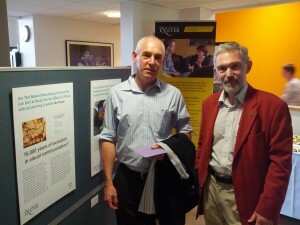 On Friday 25th May, the winners for the Images of Research 2012 competition were announced. The competition was run jointly by the Library and Employability & Graduate Development and was open to all postgraduate researchers. It aimed to highlight the wide range of research that is taking place at the university, using images to look at that research in a new and exciting way. There were three categories and a winner was selected in each by our panel of judges. Congratulations to the winners and thanks to all those who entered. Thanks also to the Annual Fund for their generous support of this project. The posters are now available to view in the breakout space in the Research Commons. This entry was posted in Research, Research Commons and tagged Images of Research, PGRs, PhD students, postgraduates, Research, Research Commons, researchers on 1st Jun, 2012 by cagale. This entry was posted in Research and tagged Open Access, Open Exeter, PhD students, Postdocs, research data management, researchers on 15th May, 2012 by Hannah Lloyd-Jones. The Open Exeter team will present “How to Write a Data Management Plan: A Short Guide”, followed by coffee and cakes at the Cornwall campus in April. All researchers and PhD students are welcome to attend this event, which aims to help researchers who increasingly will need to write data management plans as part of their funding applications. The talk will take place on 23rd April, from 12:00 – 12:30 in Lecture Theatre 1, Peter Lanyon Building, Cornwall campus. You can register for the event via our Facebook event page or by sending an email to h.lloyd-jones@exeter.ac.uk but feel free to come along even if you haven’t registered! This entry was posted in Research and tagged Cornwall, Open Access, Open Exeter, PhD students, research data management, research funding, researchers on 12th Apr, 2012 by Hannah Lloyd-Jones.